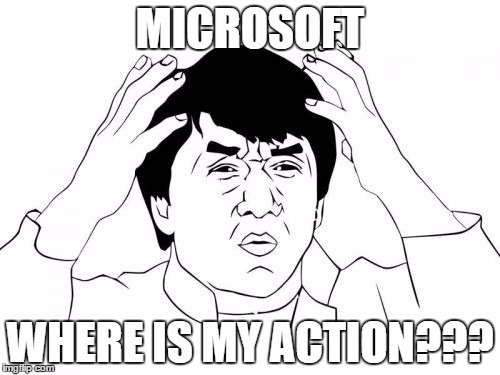 Why my action is not available through WebApi? My action had couple of simple (strings and integers) input parameters and had to return one string and one EntityCollection in result. To make action available through WebApi I had to remove all outputs except EntityCollection. Let’s separate all types of arguments into two groups – simple (boolean, datetime, decimal, float, integer, money, picklist, string) and complex (EntityReference, Entity, EntityCollection). You can have any combination of simple output parameters or single complex output parameter to make your action available for WebApi. In other words if you combine complex output parameter with any other one (including another complex output parameter) your action becomes unavailable for WebApi calls. Next Developer Toolkit for Dynamics 365 (public beta 1) – what’s new? Thanks for the info, have you tried to open the issue with Microsoft regarding this? I have not. May be it’s a good idea to post it to CRMIdeas portal. I was able to find a workaround – I just added all additional information I need as a last element of collection and it worked fine. Has anyone tried to return one EntityCollection from the CustomAction with different entity types ? Yes, I experienced similar issue as well. Everything worked fine when I used SOAP calls but for WebApi it doesn’t work well. I ended up with changing output parameter to string and I serialized response as a JSon string and deserialized it back on client side. Worked like a charm. Thanks, I will vote up. I will vote this up as well. We are seeing issues with our custom actions not showing up in the Metadata for the webapi. Only the actions which were imported from a solution do not show up in the Web Api metadata. If the action is created in the CRM instance, it shows up in the metadata. I looked at the metadata as suggested and do not see the Action name anywhere. It’s weird that you can’t see it in metadata. I believe that issue was addressed already. What you can try – delete action and create it from scratch. Sometimes publishing happens immediately, sometimes it happens in hour or so. Anyway I believe you can reach Microsoft support and open a support ticket to get help. I have a theory: There needs to be some other customizations present besides the Action when you publish the solution for the Action to show up. Sounds like a bug, but this may be the workaround. I am still working through this as it’s now complaining “resource not found for the segment action_name”, but I know it’s there. Good afternoon, actually I have the issue that I can’t call any of my customs actions. but when I try to call it, I got the error message No HTTP resource was found that matches the request URI. Do you know how can I do to fix this issue? Is it global or entity-specific action? I am getting the same issue. Did you get the solution? If yes please share it. Do you use Online or onprem? What version are you on? Is it global or entity specific action, please post code you use. "code":"","message":"No HTTP resource was found that matches the request URI 'https://dent-crm-w01.dycd.nycnet/DYCDCRMAttendance/api/data/v8.1/dycdpts_potentialConflict&#039;." If everything is correct in code I see only the one way – open a ticket with Microsoft and ask for support. I would recommend to troubleshoot all calls using PostMan first and then went to JS.